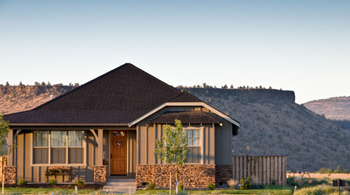 To ensure that IronHorse in Prineville, Oregon, is developed and maintained to the highest practical aesthetic standards, real estate architectural Design Guidelines and CC&Rs have been established. The Design Guidelines include a Prototype section to establish building prototypes to guide the development according to the master plan and zoning for IronHorse. The information in this Prototype section is intended to help you, your designer, architect, builder, contractor and/or landscape professional to understand the guidelines regarding the allowable uses and site restrictions in IronHorse, including home and townhome construction. The Construction Approval section follows the Prototype section, and describes the application and approval process through the Architectural Review Committee. The Architectural Standards section describes allowable standards and regulations to be used in the design and construction process. The IronHorse Design Guidelines have been divided into smaller sections to facilitate faster download times, although these are still large documents and each may take a few minutes to download. Part 1 of the Design Guidelines contains an 11×17 Summary Table of information related to all of the Prototypes in IronHorse, which should probably be printed separately. To download a section in Acrobat PDF format, click on the section title below (These documents require the Adobe Acrobat Reader. Click here to download the free reader.). The Declaration of Covenants, Conditions and Restrictions (CC&Rs) is intended to protect existing homeowners and guide the construction of new homes, townhomes and other buildings within the IronHorse community in Central Oregon. The recorded IronHorse CC&Rs are also available here for download in Adobe Acrobat format. Just click on the section title listed on this page. Note: These documents may be subject to change. Please call 541-382-1662 or email us to confirm that this document is up-to-date or to ask for a printed copy of the IronHorse Design Guidelines or CC&Rs.